Ratatouille is by far a summer fav. It’s quick to pull together and the freshness of the season’s bounty lets its simplicity warrant a plate full of flavor. That’s truly the key to this recipe—garden-fresh veggies. If you aren’t growing your own, get to your local farmer’s market and grab a squash or two, a few vine-ripened tomatoes, and fresh basil. It will make all the difference. 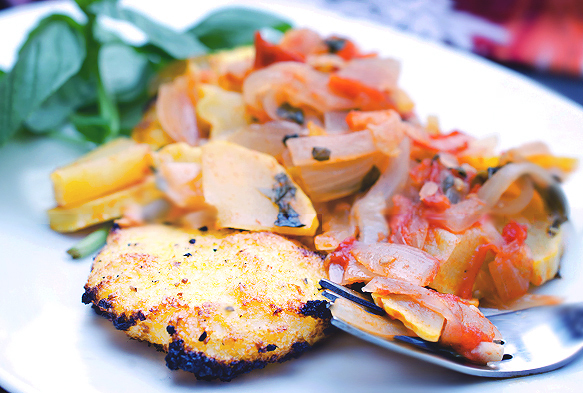 I paired this summer squash version of ratatouille with slightly charred polenta cakes, simply crisped up under the broiler. I can totally see these thrown on the grill too, just be sure to also throw a sheet of aluminum foil below them to prevent any dismantlement. If you decided to stick with the oven route, avoid getting sidetracked during the cakes’ baking time. This girl over here ended up setting off the smoke alarm. Twice. Ooops. As a light summer dish that comes together in no time, this is one I ideally picture eaten outside, catching the sun before it goes down and perhaps paired with a glass of red wine. Despite the brief ear-piercing episode from my smokin’ oven, my polenta cakes ended up perfectly charred. With each bite from these, picturing the romanticized Italian backdrop from your own yard gets easier and easier. Combine polenta and water in a pan, cover, and bring to a boil. 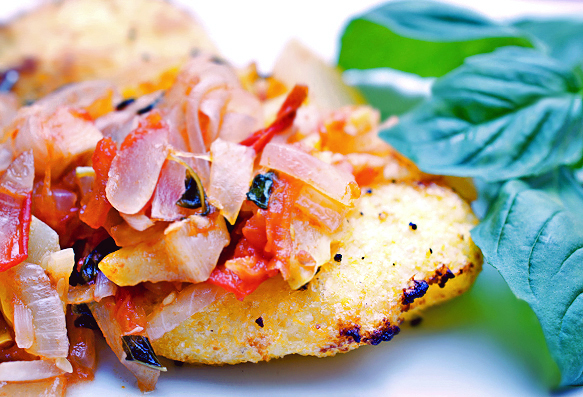 Reduce heat, and simmer for 5 minutes, or until water is absorbed and polenta is soft. Set aside and let polenta firm up. In a large saute pan, heat oil over medium-high. Saute onion, garlic, and serrano chili peppers/hot sauce for two minutes. Stir in chopped tomatoes, and saute another minute. Add squash, and a palmful of salt and pepper. Recover and simmer for about 10 minutes, or until squash is tender, adding basil halfway through, and stirring occasionally. Remove from heat, and garnish with fresh herbs, if desired. Once polenta is firm, shape into 8 patties. Brush both sides with butter or olive oil and season with salt and pepper. Place on an aluminum foil lined baking sheet. Broil until top edge is crispy, 5-7 minutes, flip, and repeat. Remove from oven and top with vegetable mixture. Serve. Looks good. I want a bite :). I have a new found love…polenta! I mean, I’ve always known I really enjoy it, but lately I’ve been seeing it in a lot of recipes and I’m sort of craving it a bit 🙂 Thanks for the wonderful recipe! That looks perfect for summer – will definitely be trying it soon!